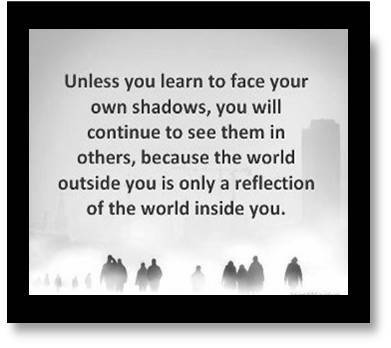 What are you REFLECTING today??? The major issues people face is about others not recognizing efforts or not being given the due even after persistent efforts and hard work. The result is a super dip in confidence, a feeling of revenge or depression/anxiety and a whole bunch of lower emotions surface. This further leads to worse situation where we tend to attract more of such situations and then we really do not know what is wrong with ourselves or may be others. Whatever is happening in your life YOU are attracting it , it is a simple statement but very profound. Whether it is your job, your relationship, your family and friends all these people are a physical manifestation of your thoughts. So do not blame them for being in your life if you were not a vibrational match to them you would have never been together as only like vibrations can co exist. Now if you have to transform any such situation at work or home you just need to change the way you think about them. So if your boss does not recognize your efforts start blessing him and also project thoughts that you want him to reflect for you. Try the same on any relationship you want to fix up. Blessing is a wonderful way of transforming any person or situation, but it should be heartfelt and continue it for 2-3 weeks. If you reflect love, appreciation, kindness, generosity and gratitude towards others you will receive it generously from source (god/universe) in different forms. Likewise if you are reflecting arrogance, hatred, jealousy and any other negative emotion be prepared to receive it in abundance as well 🙂 . The age old proverbs “What you sow you reap” applies in day to day actions, words and thought projections. So just try this small technique and take charge of your happiness TODAY.